On the 22nd September 2017, DEVIN TOWNSEND PROJECT played a special show at the Ancient Roman Theatre in Plovdiv, Bulgaria, celebrating the 20th anniversary of the landmark Ocean Machine album in full, as well as a set of fan-requested tracks alongside the Orchestra of Plovdiv State Opera. This concert was filmed, and on 6th July 2018 it will see the light of day as Ocean Machine – Live at the Ancient Roman Theatre Plovdiv. Today sees the launch of the first video to be taken from the live release, and you can watch DTP perform the track "Truth", alongside the orchestra, on KNAC.COM HERE. After a long and arduous process, the concert myself and the DTP performed in Plovdiv Bulgaria is finished, and here is your first view of it, "Truth". 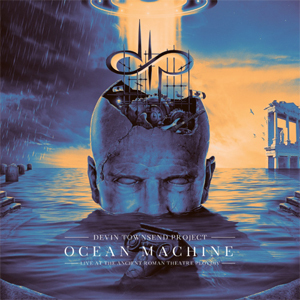 Ocean Machine – Live at the Ancient Roman Theatre Plovdiv will be available as a limited deluxe 3CD/2DVD/Blu-Ray artbook (with liner notes from Devin and a special documentary dubbed Reflecting The Chaos on the second DVD & Blu-Ray), Special Edition 3CD/DVD Digipak, standalone Blu-Ray and as digital audio download.